My new flat is very tiny so I'd like to get rid of a few things before I go. Please check below and see if there's anything you fancy, and feel free to get in touch with sensible offers. All items have been well looked after and come from a smoke-free, pet-free home. For things not listed on Etsy, email me at helenmaegreen@gmail.com for a Paypal invoice. I post internationally. Also, for the things listed on Etsy, there are more photos included if you click through to the listing. All items are covered by Distance Selling Regulations. All information can be found in my Etsy shop policieshere. Please check the shop policies before purchasing. In accordance with these regulations, sales to EU buyers can be cancelled from point of sale up to 7 working days following receipt of the item. Items are posted by Royal Mail 1st class unless requested otherwise. 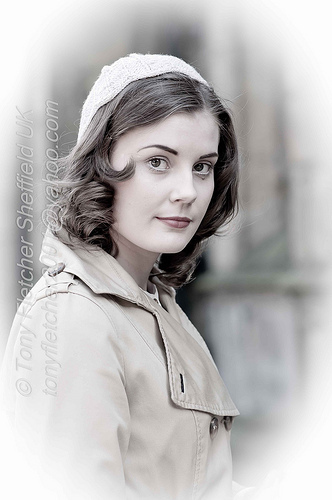 This handmade 1940s style skull cap is perfect for re-enactment or would make a great addition to any 40s wardrobe. As new. 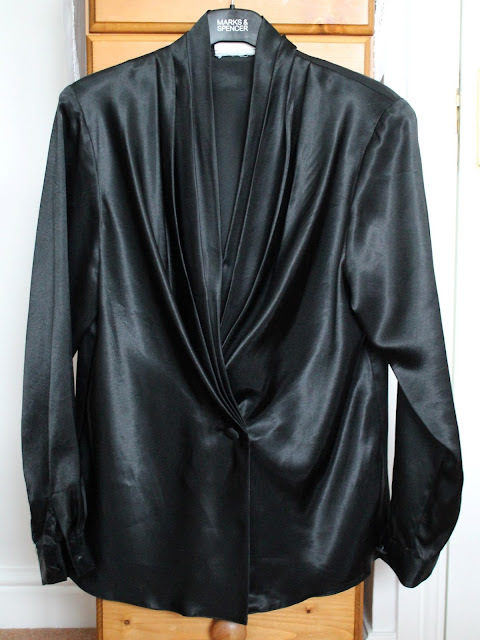 1980s black velour evening jacket. The brand is Your 6th Sense (C&A). Fits a UK size 16 but also works for smaller sizes with a belt around the waist which creates a peplum effect around the bottom. Features a beautiful swirl design to the fabric and a scalloped neckline. 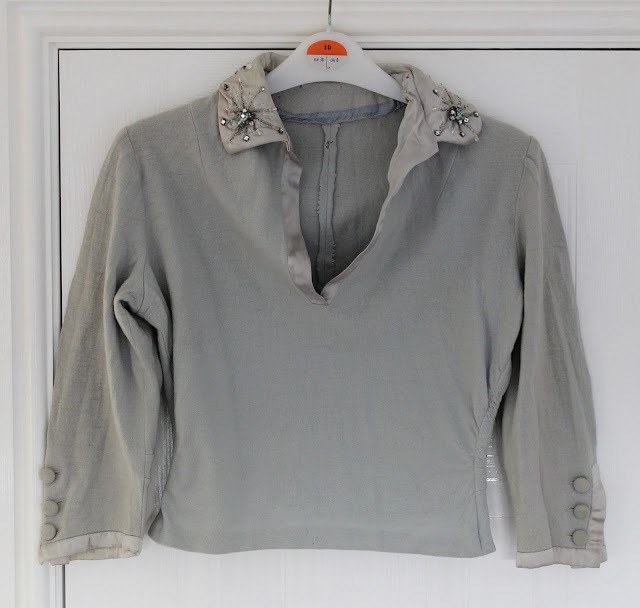 Brushed cotton 1940s blouse/sweater with a beautiful bead embellished satin collar. Roughly UK size 8. This item seems to have been hand-made and does not contain any kind of labels or tags. This is too short for me so would be best suited either to a petite lady, or it could be worn as a cropped style. Good, with some light wear as to be expected for an item of this age. There are a couple of small holes to the outside of the item which are not obvious when the item is worn (shown in photo 4 on Etsy). There are a few small holes to the inside of the item which are not visible at all when the item is worn. There are one or two beads missing from the collar. Probably best suited to slightly smaller measurements so as to get the full draped effect. Condition: Excellent. There is some very light wear to the cuffs, but otherwise it is in near perfect condition. £16.50 plus postage, find it on Etsy here. 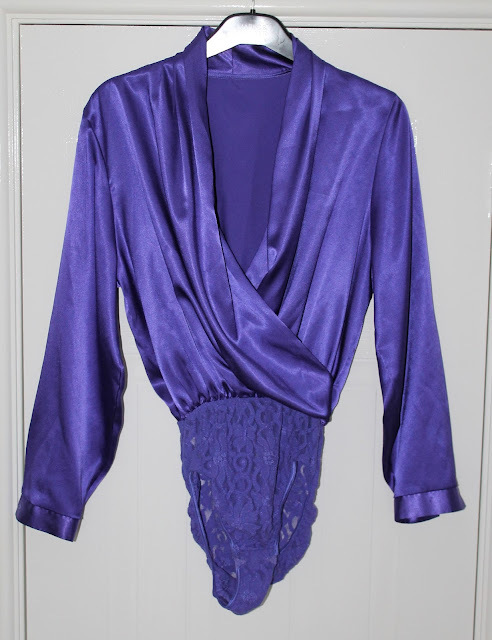 1980s purple evening blouse featuring a lovely draped front and a lacy bodysuit-style bottom with snaps to keep the blouse neatly tucked into your skirt or trousers. Waist: Difficult to measure due to draped front of the blouse, approximately 26-17"
Hips: Measurement taken from join between blouse top and bodysuit bottom; this section is elasticated. 8 1/2" unstretched, 16" stretched. Condition: Excellent. This blouse even still has its original spare button. £12.50 plus postage, find it on Etsy here. 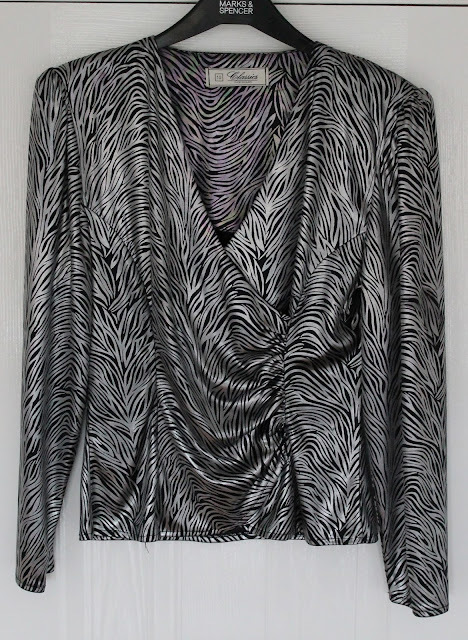 Beautiful and unusual 1980s evening blouse in an iridescent silver and black zebra print. The print shows pink and green in places as it catches the light. 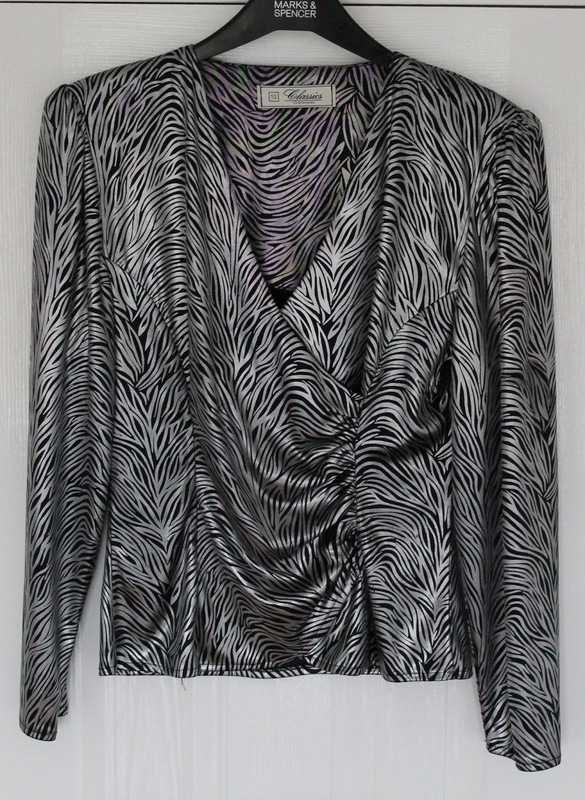 Featuring a low-cut draped and gathered neck line. This blouse has shoulder pads but these could easily be removed if desired. 'Classics Debenhams' label. 100% polyester. Very good. The print is slightly faded throughout (you can see from the inside of the item that the pink and green colouration was once much stronger) but this does not detract too much from the overall effect. £12.00 plus postage, find it on Etsy here. 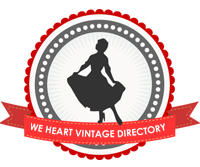 Beautiful drop-waist nautical dress from top repro brand Collectif. I have popped a small stitch in either side to hold the bow in place but this could easily be removed if you prefer the bow to be floppy. Kayser Shapers stockings in their original unopened packaging. They are a size large with a foot length of 27-28cms/10.5-11 inches and are in the colour Bengal Bronze. They are described on the packaging as sheer 20 denier run resistant stockings for longer wear. They appear to be seam-free although this is not listed on the packaging. They are 100% nylon and made in the United Kingdom. Kayser Elegance 30 denier stockings in the colour Bengal Bronze. They are size large, with a foot length of 27-28cms/10.5-11 inches. The stockings appear to be seam-free although this is not listed on the packaging. 1960s Kayser Elegance seam-free stockings. 30 denier run resistant. 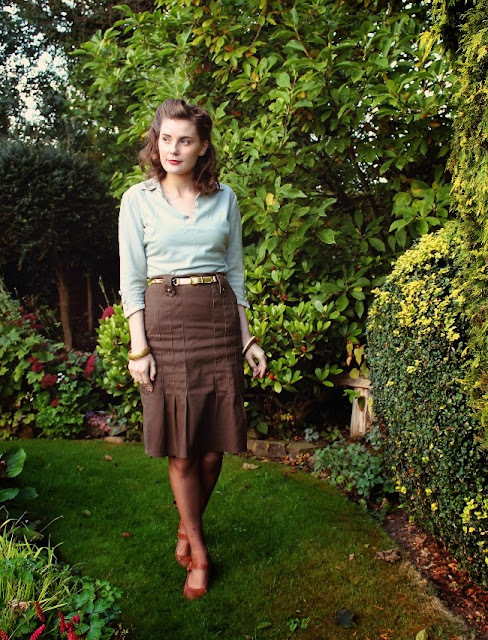 Crepe stockings "for longer wear". These stockings are labelled a size medium, with a foot length of 9.5-10 inches. The colour is dark tan. They are presented in their original packaging which has been opened, although the stockings appear to be unworn. This listing is for two pairs of Wolsey Maxi-Life sheer seam-free ladder-proof stockings, 20 denier in the colour Honey Mink. They are labelled as being size 2, and have a foot length of 24-25cm/9.5-10.5 inches. These stockings come complete with their original packaging. The packaging has been opened, however the stockings appear never to have been worn. They are 100% nylon and made in the UK. The Wolsey brand is by appointment to Her Majesty The Queen. Wishing you nothing but smooth sailing with your move, dear gal! Jessica, Porcelina - thank you for your good wishes!